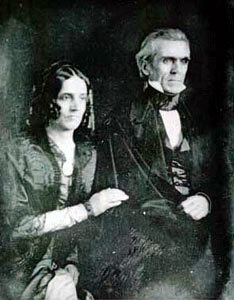 President and Mrs. Sarah Polk in 1848. 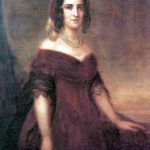 Sarah Childress Polk, wife of the eleventh president of the United States, privately strengthened the role of first lady, acting as her husband’s closest political ally while publicly dignifying her position in a manner her contemporaries held in highest esteem. The third of four surviving children, she was born to Joel and Elizabeth Whitsitt Childress near Murfreesboro in Rutherford County on September 4, 1803. Sarah grew up in surroundings fitting for the daughter of a successful merchant, tavern keeper, and land speculator. The family resided in an ample frame house two miles outside of Murfreesboro, Tennessee’s capital, from September 1819 to October 1825. The state’s leading politicians, including Andrew Jackson and Felix Grundy, frequented the Childress home when the legislature was in session; thus Sarah became acquainted with politics and political issues at a tender age. Acting on their desire to educate and train their daughters for the expected role of upper-class white women, Joel and Elizabeth Childress sent both girls to the Daniel Elam School locally and then engaged a tutor, Samuel P. Black, the principal of the Bradley Academy, to teach the girls at the school after the boys had departed for the day. Their primary education, then, exceeded that of most girls and equaled that of most boys in their community. When Sarah reached twelve or thirteen, she and her sister attended the Abercrombie School in Nashville for two years to acquire the refinements deemed proper for their station. They finished their education at the Moravian Female Academy in Salem (now Winston-Salem), North Carolina. Murfreesboro was teeming with political activity when the Childress daughters returned home. James K. Polk was elected clerk of the Senate in 1819, which gave him the opportunity to renew his acquaintance with Sarah. Polk also ran successfully for a state legislative seat. The couple’s courtship blossomed into betrothal and they married on January 1, 1824, afterward settling in Columbia. James K. Polk continued to advance politically, serving in the U.S. House of Representatives from 1825 to 1839, when he launched his campaign for governor in order to wrest political power from the Whig Party. During his extensive absences from home, Sarah Polk acted in conjunction with Polk’s closest political advisors to assure his election. She sent documents pertinent to his congressional record and kept him apprised of newspaper articles dealing with the election. Successful in 1839, Polk lost the governorship to Whig James C. Jones in 1841 and again in 1843. Sarah became despondent over her husband’s losses and worried about his health throughout and following his strenuous campaigns. In 1844 James K. Polk was the Democratic choice for president. 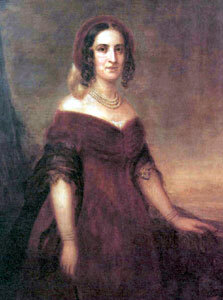 Discreet inquiries of the Tennessee delegation as to the suitability of Sarah Polk as first lady sealed the nomination. In a close race, Polk lost his home state by 267 votes but won the presidency. Childless, Sarah Polk devoted her life to her husband’s political career. During the fourteen years he served in the House of Representatives, she accompanied him to Washington on all but two occasions, his first journey and during the upheaval known as the Peggy Eaton Affair that occurred during Andrew Jackson’s presidency. Becoming acquainted with the Washington social scene and hosting parties to cement political bonds served her well when she became first lady. She had already attained a reputation for graciousness, and the Polks made it their policy never to speak ill publicly of even their bitterest of political enemies. Consequently, Sarah Polk moved easily among Whig and Democratic men and women. Throughout Polk’s four years as president, newspaper reporters praised Sarah Polk’s deportment as first lady. She fulfilled all of the tenets of mid-nineteenth-century white, upper-class womanhood. Twice weekly the White House doors were thrown open to visitors and Sarah Polk greeted her guests with dignity and charm. On those occasions she became the eyes and ears of her husband, who often declined to attend owing to pressing political matters. To save her husband’s energy, she read the daily newspapers, marking passages of interest. Sarah Polk’s behind-the-scenes role in her husband’s political career remained secret to avoid subjecting her to public ridicule. She steadfastly held to her religious upbringing, barring dancing from the White House and attempting to bar, unsuccessfully, visitors on the Sabbath. Although both Polks suffered from illness during their four years in Washington, they rarely missed church services. Upon completion of his term as president in 1849, the Polks undertook a long journey from Washington to Nashville, where well-wishers greeted them enthusiastically en route. When they arrived at New Orleans, word of a cholera outbreak reached them. They concluded their journey from Kentucky by land in the face of shipboard cases of the dreaded disease. A debilitated James K. Polk spoke before a gathering in his honor at Nashville on April 1, 1849. Although his health improved initially, he died on June 15. 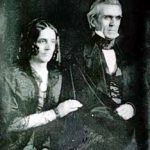 As a measure of his abiding trust in his wife, Polk praised her in his will for standing by him through all vicissitudes of his public and private life. Sarah Childress Polk outlived her husband by forty-three years, only occasionally leaving her home other than to attend church services. On August 12, 1891, she became ill and died two days later. She was originally entombed beside her husband on the grounds of their home. In 1893 the remains of President James K. Polk and First Lady Sarah Childress Polk were removed to the capitol grounds in Nashville.